These vases are finely carved in low relief in Mughal style which became fashionable at court in the mid 18th century. Mughal jades entered the court as tribute to the Qianlong emperor during this time, and there are numerous imperial poems in praise of the foreign artworks, extolling the exotic qualities of the jades, especially their lightness and the subtlety of their low relief designs which can be seen through their thin walls. With this Mughal influence and under the Emperor's orders, a large number of Chinese jades were carved in the style of the Mughal works or copying their desirable qualities, as is the case with the present lot with its simple and elegant low-relief carving. 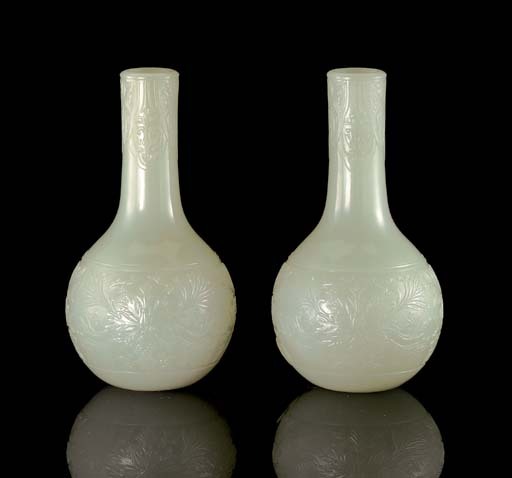 The shape of the vases themselves are based on glass examples from the same period, with the globular lower body, cylindrical neck and low-relief carved decoration.